I was thinking about something a little different for our Chicken Monday and came up with Chicken Marsala. John and I made a quick trip to the grocery store and bought some boneless chicken thighs and mushrooms. First John takes the thighs and removes extraneous fat, pounds then to a cutlet thickness, seasons and dusts them with some flour. While he does that I am preparing some broccoli and reheating the polenta we had last week. After sautéing the chicken to doneness, he removes it from the pan, and adds mushrooms which are already sauteed, some chicken broth, and butter along with the Marsala to the pan drippings to create the sauce. He makes sure that the alcohol is cooked off. He puts the chicken back in the pan to re-warm and pick up the flavor of the sauce. This turns out to be a pretty elegant meal for a Monday. 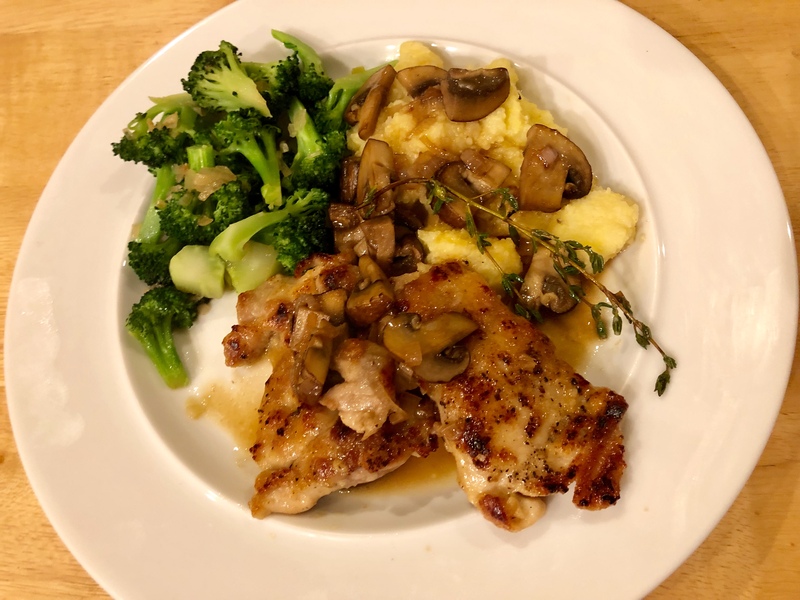 This entry was posted in Grains, leftovers, Poultry, Recipes, Vegetables and tagged broccoli, Chicken Marsala, chicken thighs, mushrooms, polenta. Bookmark the permalink.